4 · Designed for Trouble · J. B. Macabre · iv [Rodman Flender]; Rodman Flender interview. 7 · Celtic Drama · John Gilbert · iv [Stephen R. Lawhead]; Stephen Lawhead interview. 8 · The Invisible Man Revealed · Thomas Nilsson · iv [John Carpenter]; John Carpenter interview. 12 · Close to the Mark · Pete Crowther · iv [Mark Morris]; Mark Morris interview. 14 · Maniacal Realism · John Gilbert · iv [William Lustig]; William Lustig interview. 15 · Waking Up the Twilight Man · J. B. Macabre · iv [John Buechler]; John Buechler interview. 16 · Voodoo Dawn · J. B. Macabre · iv [John Russo]; John Russo interview. 18 · Time Warps and Loathing · Les Escott · iv [K. W. Jeter]; K.W. Jeter interview. 20 · Reptile Romance · Liz Holliday · iv [Anne McCaffrey]; Anne McCaffrey interview. 22 · The Storyboard Artist · Stan Nicholls · iv [Martin Asbury]; Martin Asbury interview. 29 · Sweet Dreams of Despair · James Wallis · iv [Neil Gaiman]; Neil Gaiman interview. 6 · Damaged Goods? · Steve Biodrowski · iv [Robert Englund]; Robert Englund interview. 12 · Lord of Tigana · Liz Holliday · iv [Guy Gavriel Kay]; Guy Gavriel Kay interview. 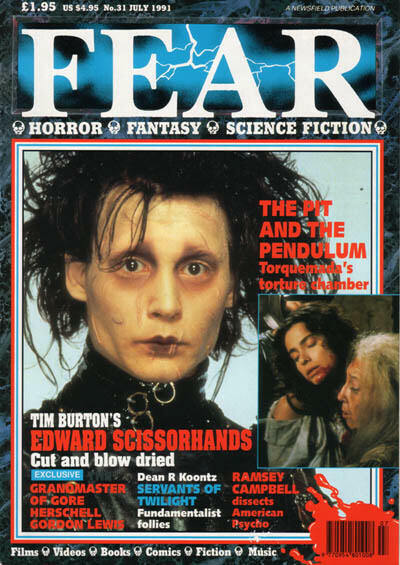 26 · Shear Genius · Mark Salisbury · iv [Tim Burton]; Tim Burton interview. 30 · Budget Chops · Thomas Neillson · iv [Herschell G. Lewis]; Herschell Gordon Lewis interview. 4 · Roll, Baby, Roll · John Gilbert · iv [Corey Haim]; Corey Haim interview. 11 · The Mummy That Wasnt · Stanley Wiater · iv [William F. Nolan]; William F. Nolan interview. 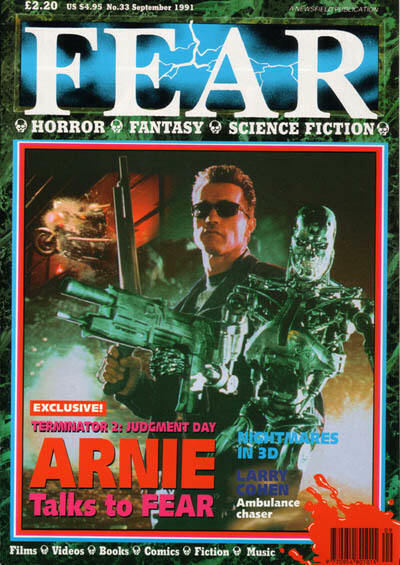 4 · Arnie Talks · J. B. Macabre · iv [Arnold Schwarzenegger]; Arnold Schwarzenegger interview. 6 · Women of Legends · Liz Holliday · iv [Marion Zimmer Bradley]; Marion Zimmer Bradley interview. 9 · Putting Voyeurs in the Picture · Philip Blinko · iv [John McNaughton]; John McNaughton interview. 10 · The Man Who Created Monster Magic · Paul Woods · iv [Forrest J Ackerman]; Forrest J. Ackerman interview. 13 · The House of Rubber · John Gilbert · iv [Bob Keen; Francis Heeley]; Bob Keen & Francis Heeley interview. 17 · Playing Rough! · J. B. Macabre · iv [Don Mancini]; Don Mancini interview. 27 · The Stuff of Nightmares! · Stanley Wiater · iv [Larry Cohen]; Larry Cohen interview. 32 · Youll Believe a Man Can Fly · Stan Nicholls · iv [Derek Meddings]; Derek Meddings interview. 4 · Part of the Soul · J. B. 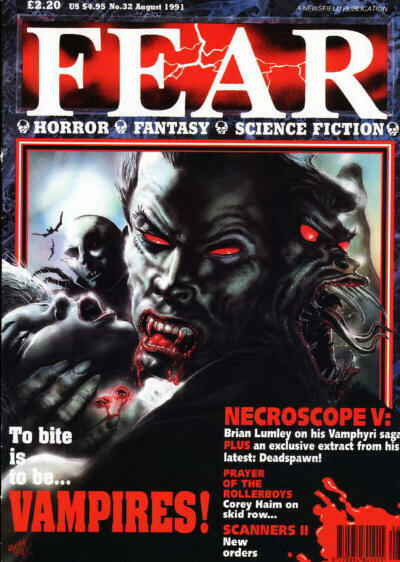 Macabre · iv [Eric Red]; Eric Red interview. 9 · Free Perceptions · Juanita Elefante-Gordon · iv [John Saul]; John Saul interview. 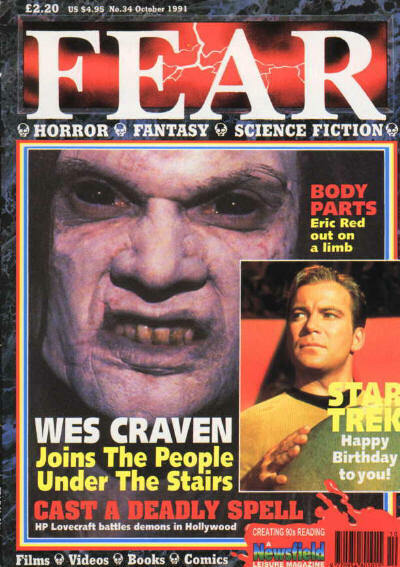 20 · Staircase Misery · Steve Biodrowski · iv [Wes Craven]; Wes Craven interview. Figment [# 7, Fall 1991] ed. J. C. &, Jr. Barb Hendee (Figment Press; Moscow, ID, $4.00, 60pp+, octavo, cover by Tom Simonton) Contains an insert of six poems by Lisa Lepovetsky, a supplement to Grue #14. 34 · New Maps of Bohemia · Bruce Sterling · ar; condensed from a talk given at Chimeracon VII, March 3, 1991.